What does a typical ballet dancer look like? Historically the perception has been that ballet is for those at the peak of physical fitness and, crucially, able to interact and communicate with each other by sight. 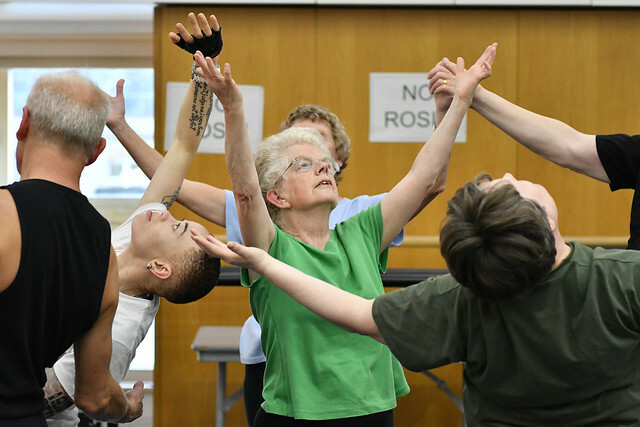 For more than twenty-five years, the Royal Opera House has been challenging these assumptions through our ground-breaking project Monday Moves, which provides ballet classes for adults with visual impairments. Coming to Monday Moves makes me feel like I’ve achieved something against all odds and this in turn has a positive knock-on effect of increasing my confidence… It makes all the difference to me to be able to start my week with my confidence in check. Each week, around 13 participants gather in The Royal Ballet’s De Valois Studio. Classes are led by former Royal Ballet dancer and teacher David Pickering and accompanied by a pianist. Many of the participants had tried other dance classes in the past, but found them difficult to follow as they couldn’t see what the teacher was doing. At Monday Moves participants have a shared movement language in the form of ballet’s French terminology, enabling faster and more accurate responses to vocal instruction. The Lord Leonard and Lady Estelle Wolfson Foundation has been supporting Monday Moves since 2013, and it is thanks to their support that dozens of blind and visually impaired people have benefitted from the project. Find out more about the Lord Leonard and Lady Estelle Wolfson Foundation.